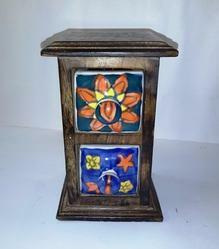 Fine Decorative Blue Pottery Ceramic Drawers Available In Different Designs & Sizes. Product DescriptionWe are Manufacture and Wholesaler of Wooden Painted Ceramic Drawer, Wooden Designer Drawers, Wooden Painted Drawer, Etc. We offer a variety of ceramic drawers that are available in beautiful colors and in different shapes. They give a royal look to the house. 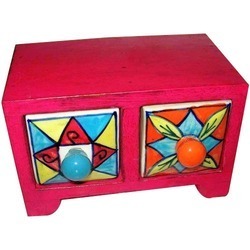 We have wide range of Painted Ceramic Drawer with high qualities & exclusive designs. Different shapes & styles are available as well.We make beautiful Painted Ceramic Drawer & export them around the world. These Painted Ceramic Drawer, we use diff. painting techniques like abstract painting, rajasthani miniature painting, cone painting etc. We also supply to corporates for gifts.. In india for the best drawers designs with quality you can contact to Sparsh Ceramics Khurja UP @9213231310. To gain strong foothold in this industry, we are devoted to offer a wide gamut of Antique Ceramic Drawer. Our offered drawer is designed using optimum quality ceramic and cutting edge technology, under the supervision of skilled professionals. To ensure its quality, experts test this drawer against various quality parameters.